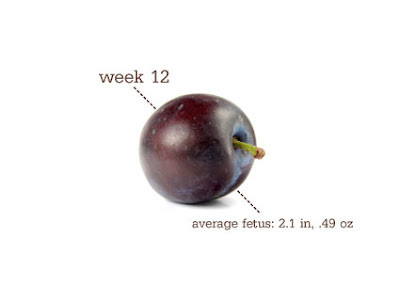 I am now halfway through my twelfth week of pregnancy. Insane! I can already feel some of the morning sickness ebbing away slowly and a little more appetite kicking in. Now is the part where I must not indulge anything I want. I refuse to be one of those puffy, pregnant women. We had our twelve week appointment yesterday and the doctor was able to pick up the heartbeat on the Doppler ultrasound. I didn't get to see Greg's reaction but I could feel it. I was beaming myself so my eyes were reduced to slits (I was smiling that big) but he grabbed onto my foot and made a few wow-like comments. Our doctor is so fabulous and fun! Greg made a joke about all of the monster energy drinks he drank around conception and cracked us all up. He just couldn't believe how fast the heart was beating. My reading had prepared me for the fast heartbeat but nothing could have prepared me for the joy. It was so stinkin cute! Greg is graduating to reality now. He made his first comment today about how it will be fun to start on the nursery. That both surprised and elated me. I've had the furniture and bedding picked out since the day I found out I was pregnant (I used it to get my head wrapped around this and to calm myself down). I've been ready to start painting for weeks now! We also picked out the ceiling fan. Now I'm just immersing my unemployed self in research for those special touches that make a nursery amazing. I also did some research today on ..... prepare yourself.... birthing photography. I know it sounds gross and totally weird but give it a minute. I personally would have the person (I have someone in mind) take some pictures during some of the more special moments during the labor and pop out for the 5-10 minutes of grossness. Someone would grab them as soon as the baby is out and then they could take artistic photos of all of the baby's firsts. I'd like good shots of the measuring, the cleaning, cutting the umbilical cord (maybe), cleaning, Greg's first hold, my first hold, the foot stamp thing, etc. I've found a couple of sites that sold me on the idea. I first read about it on a friend's blog earlier and thought gross but dutifully followed the links she provided and was sold. Check this out birthing photography My main reason for hesitating on this is that Greg and I both really wanted those moments to ourselves but we also want memories of those moments so we're torn. I think if the person was someone we were comfortable with, it would be perfect. The female and close friend I have in mind would be perfect if she would consent. Then there is the issue of whether or not others will be angry that we had a friend in the room with us but no grandparents, aunts, etc. I think everyone would be ok because they would benefit from the photos as well. Greg would be completely capable to take the photos but I don't want him experiencing all of that through a lens and I really want him with me...I'm gonna NEED him. I just have to be clear that I don't want any gory shots. No privates or grossness. Anyway, back to the current status. I'm starting to get a firm and defined bulge between my hip bones or just above my pubic bone. It's going to be time to start taking weekly pictures of my progress soon. I'll post them with the appropriate week when we get to that point.